Next Sunday, February first, is the first day of Celtic spring and is celebrated with a St. Bridget's cross made of rushes. I'll be celebrating the week with St. Bridget and her goddess counterpart Brigid with a series of posts this week. I'm using miniature St. Bridget's crosses in the Spirit Book I'm working on now. I'll show glimpses of the work in progress through the week and if all goes well, the completed book for Studio Sunday. 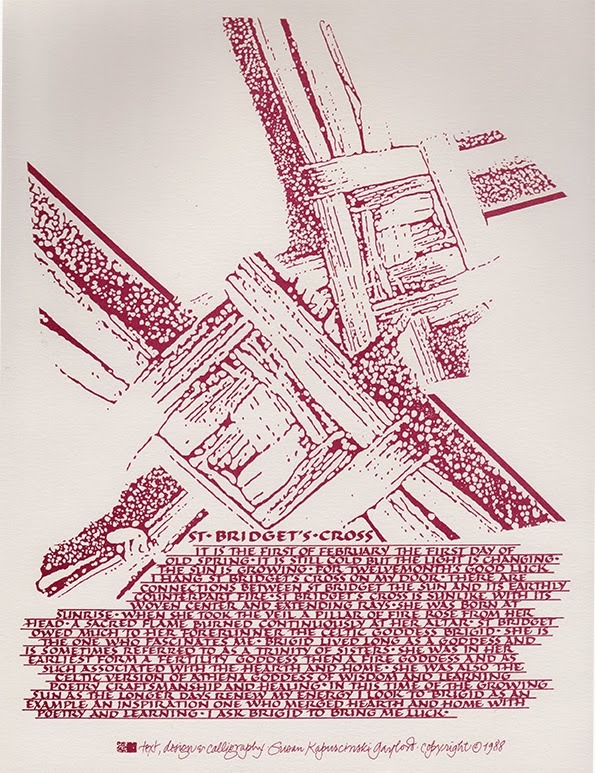 Here's the text from the above print that I created in 1988 which is considered a "vintage handmade item" on etsy. It is the first of February, the first day of old spring. It is still cold, but the light is changing. For twelvemonth's good luck, I hang St. Bridget's cross on my door. There are connections between St. Bridget, the sun, and its earthly counterpart fire. St. Bridget’s cross is sunlike with its woven center and extending rays. She was born at sunrise. When she took the veil, a pillar of fire rose from her head. A sacred flame burned continuously at her altar. St Bridget owed much to her forerunner, the Celtic goddess Brigid. She is the one who fascinates me. Brigid lived long as a goddess and is sometimes referred to as a trinity of sisters. She was in her earliest form a fertility goddess, then a fire goddess and as such associated with hearth and home. She was also the Celtic version of Athena, goddess of wisdom and learning, poetry, craftsmanship, and healing. In this time of the growing sun, as the longer days renew my energy, I look to Brigid as an example and inspiration, who merged hearth and home with poetry and learning. I ask Brigid to bring me luck. The 8.5" x 11" offset print is available at my etsy shop.